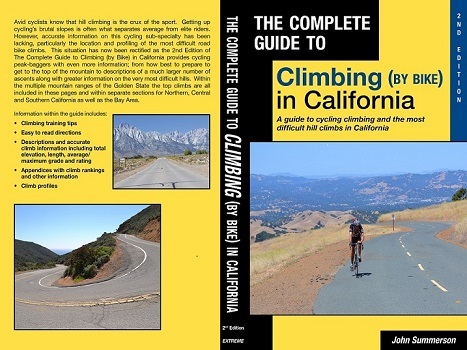 In California - 2nd Edition! After Deer Creek Road the steepest sustained climb in the Santa Monica Mountains, Corral Canyon is both scenic and challenging. Stiff grade greets you early along with a small descent. 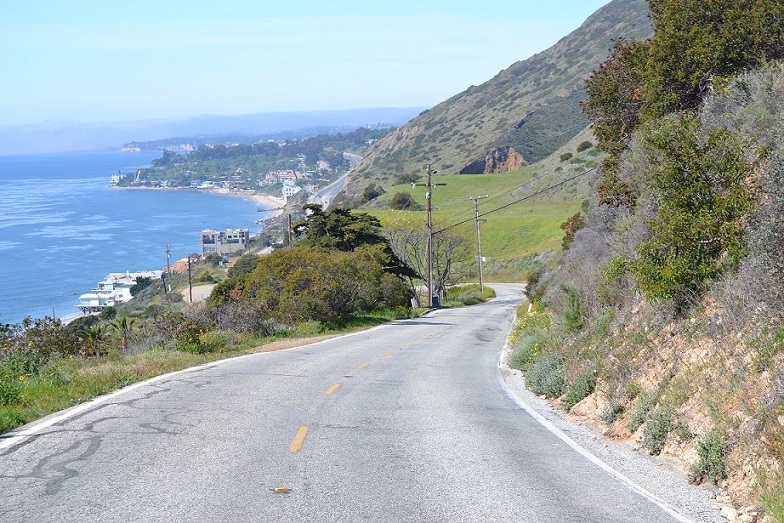 Once past the descent the road rears up to stout grade along with Pacific Ocean views. 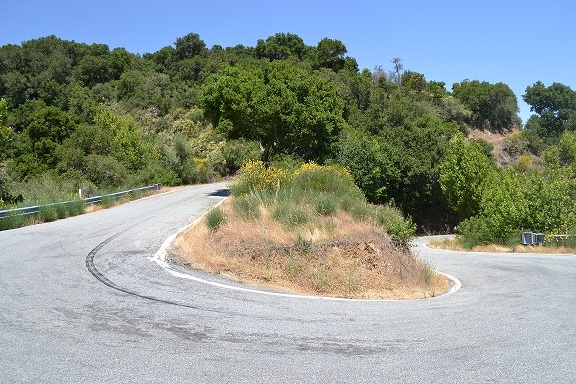 Turning inland, just before a tight switchback is the steepest grade on the hill which continues through the turn. The grade then eases and a small descent appears before climbing resumes over moderate slope as you soon climb through the village of Corral Canyon. Once beyond town the slope continues as solid before easing. The final mile is over more moderate grade and the listed climb ends as the grade eases. The pavement ends less than a mile later. Thanks to Malibu area climber Benjamin Fader-Rattner for this one. Directions - In Malibu, CA at the junction of Corral Canyon Road and the Pacific Coast Highway head up Corral Canyon Road for 0.2 miles to the creek crossing to begin the climb by continuing up the hill. Montevina Road is a difficult and superb ascent that parallels Black Road southwest of San Jose although it is not ridden as often as some other area climbs as it dead ends. It is a challenging hill however and should be included on true climbers plates. 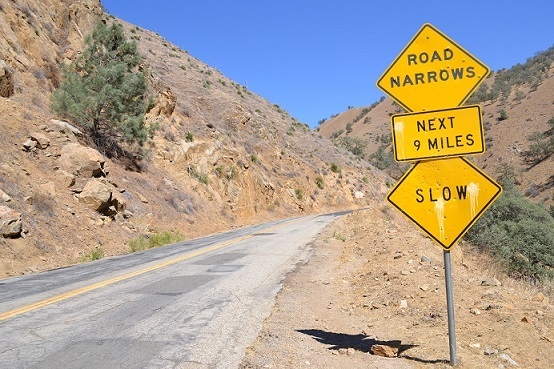 There are some residences along the hill which produce some intermittent traffic on the narrow road at times but mostly over the lower portion and likely never enough to affect your ride. A steady and stout grade down low leads into several big switchbacks in the middle of the ascent which offer good views into the valley below. Toward the top you encounter a fairly long ramp of double digit grade that leads to the summit as the road dead ends. Grade and tight turns make for an interesting descent. Directions - On Highway 17 south of Los Gatos exit to Bear Creek Road. At the top of the exit turn right onto Montevina, passing Black Road on the left. Continue on Montevina for a short distance and the listed climb begins just after the road takes a left hand turn to head uphill. Lions Trial is a stout category 1 climb located east of Bakersfield with its quite active climbing community. The grade is fairly solid right from the beginning as you head north up a drainage with some shade and little traffic most days. After several miles of fairly straight riding over stiff grade the road opens up a bit and begins to twist up the hill. You ride through several tight switchbacks as you continue to gain altitude. Towards the top you ride along a ridgeline as the grade eases. The listed climb ends at a pullout on the left (just beyond one on the right) as the grade eases further. The road continues to ascend quite shallowly for a short distance and then descends. Directions - From the rail road tracks in the tiny burg of Caliente just north of Route 58 and east of Bakersfield, head east on Caliente Bodfish road for 2.7 miles to its junction with Caliente Creek Road (straight). Caliente Bodfish Road makes a left turn here where the listed climb begins.